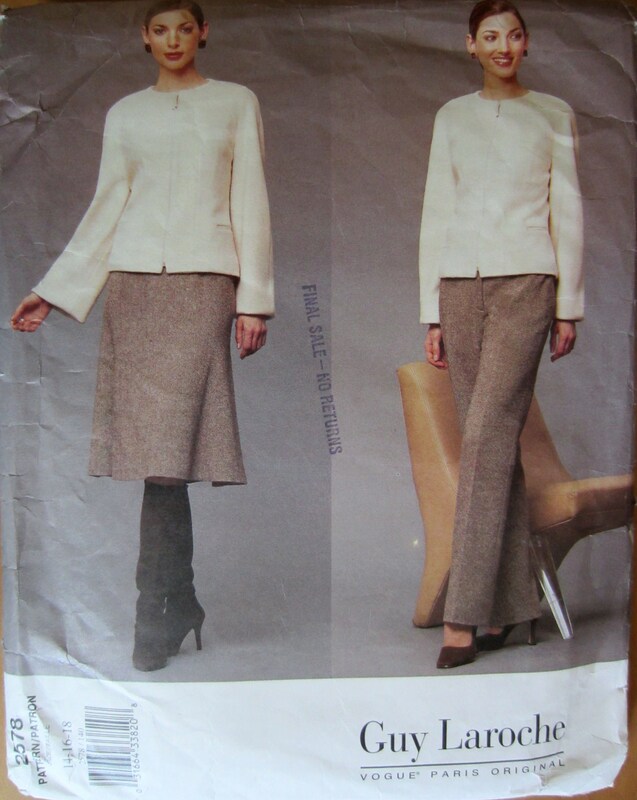 This is the latest of my SWAP 2012 instalments, and although what you notice is the blouse, this post is about the trousers! Vogue 7881 is a classic Claire Schaeffer design with couture options, but I followed a more RTW approach because I wanted them done. Well, actually, truth be told, I just didn’t feel like fussing over them and doing all the hand sewing that a couture version would require. Sometimes I just want a project out of the sewing room and into rotation! This is my second version of these pants. You can see photos of my first version in linen from about 5 years ago here. I like how this pattern is drafted. It’s easy to fit and the full straight legs are chic and comfortable to wear. It’s a very straight silhouette, and not curvy like my other favourite pattern, Vogue 2578. I cut a straight size through the hips, and tapered down one through the waist – my usual adjustments, which you all know if you’ve been following along much. The waistband is shaped and in two pieces, which makes tweaking the fit through the back a breeze. Obviously I hadn’t finished tweaking prior to taking the picture above! I need to take in the CB seam about 1/2 inch through the crotch curve. I deliberately put the CF zipper in the opposite way to the illustration/instructions because I like my zippers to open to my right, as I’m right handed. There is no fly shield in this pattern, and I didn’t bother adding one. Vogue 2578 does have a fly shield, and after making up both patterns one right after the other, I think I prefer trousers with a fly shield. But I’m not adding one now! I decided to go with a dark purple lining, and, yes, they are fully lined. I love a fully lined pair of wool trousers. I finished the hems with a Hong Kong style binding, which was slip stitched into place. There are thread chains attaching the hem of the lining to the inseam to keep the lining in place during wear and washing. The fabric was purchased in 1994, I think. It’s a Dormeuil wool, one of several in my stash purchased during the years preceding children when a fabulous store was going out of business. Isn’t it gorgeous? A good friend of mine hated the colour, but I’m totally in love with the texture of this! I’m well on my way through the SWAP program! I just have the jacket, coat, skirt and blouse to sew up and I’ll be finished with my fall sewing program! But first I have other interruptions to tell you about! Stay tuned! PS. Taking pictures in the winter months in the northern hemisphere is very discouraging! I always end up taking 100’s and trashing most of them. I’m sorry these aren’t the clearest! You are right, the blouse caught my eye first, it’s lovely. Pants are still a little intimidating to me so I’m always in awe of a well made pair. You have a sewn another great looking, well fitted pair of pants. I love wool lined pants and wear them a lot in the winter. Lovely trousers. I think lined trousers are so “luxurious”…and the colour is fantastic. Yep. Gorgeous. And the colour is fab – dunno what your friend was thinking XP. Merry Merry to you BTW. Those trousers are fantastic. The color – I love! and, they fit you perfectly. I should try sewing with a plan, it seems like it is a good way to keep on track of projects and fill some holes in the wardrobe. These look really lovely on you! I like the rusty brown colour and the classic styling. Pants get so much hard wear in the end that I can’t see the point going for the couture option. In my mind, they are ultimately workhorses. Very attractive workhorses n this case! These are lovely! You are making great progress on your SWAP!